It was a time when a lot of singer-songwriter acoustic rock (and "emo" rock) was all the rage on the American airwaves and was especially popular in my suburban college environment. While I always loved my dancefloor pop, it was hard not to also expand my musical horizons to include songs from the likes of The Fray, Dashboard Confessional (who happened to stop by my alma mater while I was there) and Death Cab for Cutie amongst others. As I attended a school with a burgeoning music program, it shouldn't surprise you that this style of "MySpace-brand" artist was a huge influence on many of my classmates, many of which doubled as musicians. 2008 also marked a spotlight moment for John Vesely, best known as the face behind rock band Secondhand Serenade, who scored big with the sleeper hit "Fall For You" that just about every band on my campus insisted on covering. The pretty ballad was a bonafide hit at Pop Radio and sat just outside the Top 20 on the Hot 100. Just hearing it now brings me right back to that place and time...so imagine my nostalgia when I heard the group, who has recently gone the indie route, will be re-releasing the album that really launched them, A Twist In My Story, this Tuesday as A Naked Twist In My Story, featuring all the original songs in a more acoustic, re-imagined way along with a brand new song in "Belong To". Take a listen to the original 2008 version of "Fall For You" below. I got the chance to hear the re-released album ahead of its release recently and was pleasantly surprised by what I found. There's just something about poetically emotional lyrics set to a backdrop of acoustic guitar and piano that pulls at your (wait for it) heartstrings, and this is no different. Aside from the gorgeous "Fall For You", revisiting this album in a new light brought to me new faves in quietly somber "Why", the sparse and lightly island-influence feel of "Stranger" that lends itself to the resurgance of Jason Mraz post-"I'm Yours" and the lyrical desperation in "Stay Close Don't Go". New song "Belong To" is very piano-based and is yet another proof positive of the lyrical prowess in Secondhand Serenade. Their brand of dreamy tunes is clearly a product of that movement of California Alt Rock (proof in point: the band itself is from Cali) that many college kids (myself included) sought refuge in to express what we couldn't on our own -- and if perhaps you didn't catch them beyond "Fall For You" back in 2008, now is your chance to re-visit a great lyrical record. A Naked Twist In My Story is available for purchase tomorrow, September 11th, 2012. An original album will also be coming along the pike shortly soon after. 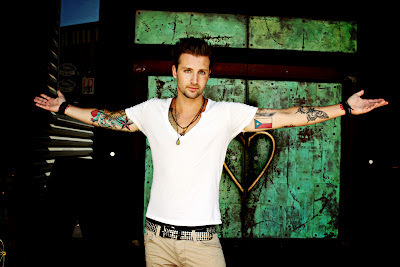 For more updates on Secondhand Serenade, you can follow John on Twitter via @secondhandjohn. Thanks for the great review of Secondhand Serenade's A Naked Twist in My Story. I still can't understand why he (John Vesely) isn't a bigger artist with the talent he has.